Age Group: Can be adapted for elementary through high school. Class Time: Two class periods (110 minutes). Students will learn about the survival and hunting strategies of several different kinds of spiders. Students will also be introduced to scientific classification of spiders. Students will search indoor and outdoor environments and record numbers and types of spiders that they discover. Students will write a brief report about one of the spider families that they observe. Students will gather in groups during the following class period and debate the pros and cons of different spider hunting and survival techniques. 2.2 Identify, analyze, and use patterns such as cycles and trends to understand past and present events and predicting possible future events. 2.3 Identify and analyze systems and the ways their components work together or affect each other. 2.5 Understand that under certain conditions nature tends to remain the same or move toward a balance. 2.6 Understand how living and nonliving things change over time and the factors that influence the changes. All spiders are predators. They eat insects, earthworms, and even other spiders. Large species prey on vertebrates like fish, rodents, and birds. All spiders have fangs and most of them use venom to immobilize their prey. Many spiders snare prey with webs. But not all spiders use webs. Some are active hunters that patrol the ground for unwary crickets and beetles. Others sit camouflaged on flowers, waiting to ambush bees. And the ones that use webs have hunting strategies that vary tremendously depending of the type of spider. Thanks to these many hunting techniques, spiders are very successful creatures. In fact, spiders can be found almost anywhere. There are spiders in caves, barns, streams, and trees. Some spiders are able to dive underwater in search of food. Spiders do very well inside homes, too. This lesson is divided into two main parts. A "Spider Safari" will allow students to introduce themselves to different kinds of spiders. The "Spider Debate" which follows will allow students to consider the pros and cons of different survival strategies exhibited by each kind of spider. In addition to introducing students to spider diversity, this exercise will reinforce concepts such as: scientific classification of organisms, food chains, interactions between organisms in their environment, ecological niches, and structure and function in living systems. This exercise also requires library or internet research, and introduces students to organized debate. Spider Safari: In Kentucky, especially during spring, summer, and fall, a quick Spider Safari around the house and through the yard will reveal many common families of spiders. This Spider Safari will form the first part of this lesson. For this exercise, take a few minutes to describe the Spider Safari to students. Explain that the safari will involve a search of at least one indoor and one outdoor environment for at least 30 minutes each. Students will be looking for eight different kinds of spiders, which are described below. These represent different spider families. Make sure that students know the basics about spiders: eight legs, two body-parts, the fact that they are predators, etc. But don't spend too much time on the different kinds of spiders: the goal for this exercise is to let students learn about the different kinds of spiders through their own observations, research, and during the follow-up debate. The "Spider Safari Survey Sheet" that you hand out will have the name of each kind of spider, where the spider is found, and what it (or its web) looks like. That's all the students need. Encourage the students to try a number of different environments, and to search during both the day and night (if they dare!). Barns and work sheds count as "indoor" environments, and will invariably have lots of spiders. Tell students that they don't have to go into creepy, dangerous places like basements or attics to find spiders-- spiders are very common in living rooms and bedrooms if you look hard enough! It is not necessary for everyone to find all eight different kinds of spiders, but they should be able to find at least three. Also remember to warn students not to handle the spiders. Spiders are normally not dangerous, but they are wild animals, and should be treated with respect. Give the students a few days or a weekend for the Spider Safari if you assign it as homework. As part of the Spider Safari, the students will be asked to pick one of the eight different types of spiders that they will be looking for. They will then find some information about this type of spider, including the family name, number of worldwide species, or any other kind of information, depending on grade-level. Spider Debate: When students come back to class with their Spider Safari Survey Sheets and reports, divide the students into groups based on which kind of spider that they choose to do a report on. Or, if you like, divide them into just two groups: "web-building spiders" vs. "hunting and ambush spiders". Hand out the "Spider Debate Case File" sheets and give the groups a few minutes to prepare a "case" for their kind of spider: why they think their spider type has the best type of hunting/survival strategy. Then, allow groups to debate the pros and cons of the different types of spiders. Encourage students to pick a spokesman, or to only contribute when recognized. Recruit a small group of students to be impartial judges who will decide which kind of spider has the best strategy (or they may decide that all of the strategies are equally valid!). Some points that might help keep the debate rolling: many of the spiders that are common indoors would probably not be as common if humans became extinct, whereas many spiders that live outdoors are not as dependant on people. Spiders that build webs are for the most part dependent on flying insects. Which spiders are better at defending themselves from other predators? Some of the spiders with the most interesting hunting strategies (like trapdoor spiders) are very rare: is their strategy a good one? Of course, scientists will tell you that there is no "best strategy" for spiders, but a good debater might disagree! Below are some basic facts about each of eight very common spider families. There are plenty more spider families than this, but these are the ones that are probably the easiest to find and recognize in Kentucky. If you are working with very young children, don't worry about family names, but you can still use the common names. Remember that in scientific classification, "family" is just below "order" in terms of decreasing generality (Kingdom, Phylum, Class, Order, Family, Genus, Species). You can recognize a family name because it always ends in "idae." All spider families are in the order "Araneae," which is in the class "Arachnida." These are what people normally think of when they hear the word "spider." Orb-weavers, cobweb spiders, and others produce strands from silk glands located on their abdomens that they use to create prey-snaring structures. The type of structure varies with age, species, and (especially) spider family. Web-building spiders are probably the ones that we see the most, but that doesn't mean that they are the most common. Generally, web-building spiders have small eyes and poor eyesight: since their webs catch food for them, web-building spiders don't need to see as well as other kinds of spiders. Family Arneidae (Common name- Orb Weavers): Spiders in this family (and a few other small families) are the ones that build "orb-webs." Compared to other kinds of spider webs, "orb webs" appear the most organized to human eyes. Orb-webs consist of a series of rays and connectors that looks like a group of concentric circles. 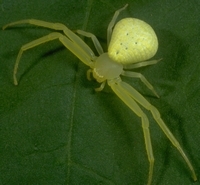 Orb-weavers typically have large, robust abdomens. Orb-weavers tend to be found outdoors where they have plenty of space for their intricate webs. Theridiidae (Common name- Cobweb Spiders): Cobweb spiders are similar to orb-weavers, but their webs are not constructed in recognizable geometric patterns. Cobwebs also tend to be more three-dimensional than orb-webs, which are usually flat. Cobweb spiders and orb-web spiders look very similar, and the best way to tell them apart is by their webs. To the trained eye, however, the abdomens of many cobweb spiders appear to be relatively larger (compared to the rest of their bodies) and more spherical than those of orb-weavers. This is not always true, but it is something to look for. Cobweb spiders are fairly common inside homes, probably because they don't need much space for their webs. The notorious "black widow" is a member of this family. Pholcidae (Common name- Cellar Spiders): Cellar spiders are very common in homes where they build webs that look very much like cobwebs. 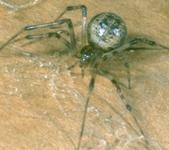 Cellar spiders are much larger than most cobweb spiders though, and have very long, skinny legs. These spiders are often called "daddy-long-leg" spiders, but these spiders are not related to the other kind of daddy-long-legs (which are not really spiders at all). Agelenidae (Common name- Funnel Weavers): Funnel weavers typically build a flat, dense web close to the ground which curls into a funnel. These spiders usually wait deep inside the funnel, and when something falls or stumbles into the web, the spider rushes out and grabs it. The end of the funnel often dips into a crevice or underneath a rock, which provides the spider with protection. Funnel webs are often especially visible on late summer mornings thanks to heavy dewfall. Wolf spiders, crab spiders, and others don't rely on webs to catch their food. Instead, these spiders actively hunt for prey, or lie in ambush. These spiders often have very keen eyesight. Although these spiders don't use silk to hunt, many of them will wrap their egg cases in webbing, or have other uses for silk. 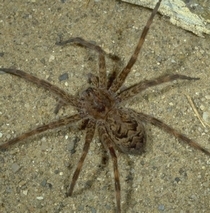 Family Lycosidae (Common name- Wolf Spiders): Wolf spiders are extremely common both indoors and outdoors. They are often seen under rocks and pieces of wood. These spiders run quickly over the ground in search of prey. Most wolf spiders are gray, black, or brown, and are somewhat hairy. After laying her eggs, female wolf spiders of many species will carry their egg sacs until the eggs hatch. Upon hatching, the spiderlings will then "ride" on the mother's back until they are ready to hunt on their own. Family Pisauridae (Common name- Fishing Spiders): Fishing spiders are very similar to wolf spiders, but tend to be a little lankier. They are commonly encountered near streams and ponds, where they will sometimes catch small fish, tadpoles, and other aquatic creatures. Fishing spiders are able to "walk on water." They are also able to go underwater to escape predators. Fishing spiders can get to be very large, with leg-spans approaching three inches! 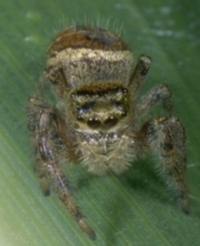 Family Salticidae (Common name- Jumping Spiders): Spiders in the family Salticidae have a distinctive, flat-faced appearance. Jumping spiders also have very large eyes: of all insects and spiders, jumping spiders may have the best eyesight. Jumping spiders are also characterized by a "herky-jerky" way of moving around. In fact, it looks like they are hopping small distances every time they move. Although they hop most of the time, jumping spiders are able to jump long distances as well. Jumping spiders are very common inside homes and in yards and gardens, and are very easy to find. Unlike many other kinds of spiders, jumping spiders are active during the day. Although jumping spiders don't use webs to catch food, they will use a strand of silk to secure themselves when they are jumping long distances (much like Spider Man!). Family Thomisidae (Common name- Crab Spiders): Crab spiders don't use webs, but they aren't really active hunters either. Crab spiders are ambush predators. They sit and wait for prey. Most crab spiders are camouflaged, and are able to hide in flowers without being seen. When a bee or fly visits the flower, the crab spider is able to grab it. Crab spiders have potent venom, and are able to catch insects that are much larger than themselves. Crab spiders look a little like crabs, with long front legs and flat bodies. Many of the common crab spiders in Kentucky are brightly colored. Bright green, yellow, and orange varieties are often seen. This inexpensive guide contains detailed drawings of all of the common spider families (and many species) that occur in the Eastern United States. Contains photos of many spider families and species. Find as many of the different kinds of spiders listed below as you can. Place a tally mark beside each kind of spider each time you find one. You don't have to find all of them, but you should be able to find at least three kinds. And make sure you find at least one web-builder and one hunting/ambush spider. Search for at least 30 minutes in one indoor and one outdoor area, and write down where you observed each spider. Write down anything else interesting as well: What color was the spider? What was it doing? REMEMBER: "Daddy-long-legs" aren't real spiders! Webs are intricate and geometric. and barns, but are found almost everywhere. in homes, especially attics, basements, and pantries. Large, hairy spiders. Usually brown, black, or gray. Look like funnel web spiders, but do not live in webs. spiders. Found under rocks, leaves, and logs. on tree trunks, the sides of buildings, and fences. Resemble crabs, with flat-bodies and long front legs. Often "neon" green, yellow, orange, or bright white. Pick one of the kinds of spiders that you observed and find some information about it. The first step is to figure out which kind of family your spider is. For instance, "wolf spider" is the common name for a certain family of spiders, which also has a scientific name. If you look up wolf spiders in a book about spiders or on the internet, you will probably be able to find the family name. Remember that scientific family names always end in "idae." After you find out the family name for your spider, find out some more information. Such as: how many species of spiders are there in this family? What kind of prey does this kind of spider like the best? How big are the largest members of this spider family? Any kind of information will do, and it should be easy to find in books about spiders or on the internet. Think about the good points and the bad points about your spider's hunting strategy. Even though you are trying to argue that your spider is the best kind, it is good to think about its weaknesses as well. 1. Spiders that build webs are often conspicuous: it is easy for predators to find them because they are out in the open. 2. Spiders that are active hunters have to use lots of energy to run around and catch food. 3. Ambush predators have to get lucky! If no food comes to them, they can't eat.